As a thank you for following and supporting my creative journey, I've created free printable gift tags especially for you. 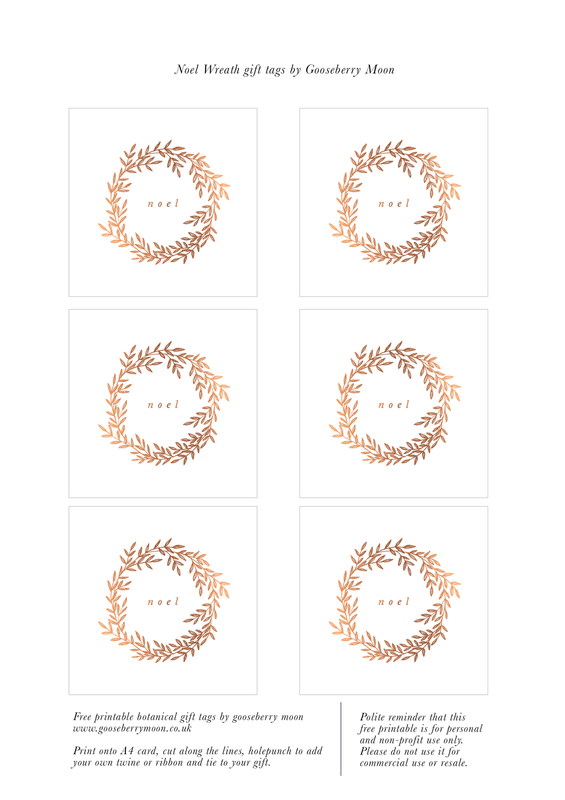 They have been created from my original botanical wreath design digitally coloured in faux copper and come as a printable sheet of six tags. I'd love to see how you use these tags. You can hashtag gooseberrymoon over on instagram and tag me @gooseberrymoon. Click on image above to download printable file. Over two years ago I designed these Christmas tags as a free download for email subscribers. They have now been re-pinned on Pinterest over 23 thousand times and the cause of way too many emails asking how to get hold of them. I'm so pleased that they are liked by so many people. In the hope of reducing some of the email requests I've decided to put them on here to make it easier for everyone to download (please note these are for personal use only). I'd love to see how you use these tags. You can hashtag gooseberrymoon over on instagram and tag me @gooseberrymoon. Scroll down past the images for the download link. Click here to download your free Christmas gift tags. In the hope that I can add a little something special to your gift giving, I've created free printable gift tags especially for you. They have been created from my original botanical illustrations in two designs. Both come as a set of three with 2 of each on a sheet. Scroll down to find the download. To get yours simply click on the links below, print a copy on your desktop printer, cut out the tags, hole punch and add some pretty twine or ribbon. The silk ribbon shown in the images are from a range available in my online shop. I'd love to see how you use these tags. You can hashtag gooseberrymoon over on instagram and tag me @gooseberrymoon.